The first decision to make is whether you want to create a new blank configuration, or upload an existing configuration from the remote control. Although I had already managed to get somewhere with the on-remote software, I felt it would be best to start fresh. The Xsight Touch uses a wizard-based approach that walks you through each step, even going so far as to include Flash movies demonstrating certain functions. The first step in the wizard is selecting the types of devices you want to control. 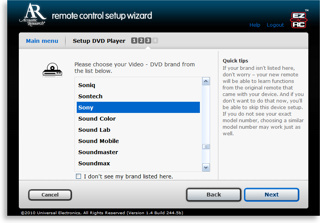 Initially the wizard offers a brief graphic-heavy menu with 12 core device types, but clicking on a small option switches this to an advanced list with an overwhelming 74 entries – nearly everything you can think of is listed here, with normally generic items such as “Television” broken out into “LCD”, “Plasma”, “Rear Projection”, “DLP”, “Video Projector” and so forth. The main graphical menu offers an estimate of how long programming the selected number of devices will take, but this is not shown with the detailed view. Switching back and forth between simple and advanced views may result in missing or duplicate devices. When your list of devices has been finalized, the wizard proceeds through the configuration of each device one by one: naming it, and then selecting a preprogrammed codeset. UEI’s full database comes out to play. Ah, preprogrammed codes! Unlike the brief on-remote sampling of codesets, the wizard offers a truly awe-inspiring level of brand completeness... and since this is all stored online, the database will be continuously updated with new products as they’re released. Once a brand has been selected, the wizard presents four ways to find the correct code. First is using the device’s actual model number; second by the original remote control’s model number. It’s not important that you enter a complete or fully accurate model number for either of these methods – as little as 3 characters are enough. For example, entering “999es” for my DVD player immediately brought up the correct “DVP-NS999ES” model. The third setup method is for when you don’t know either pieces of information, while the fourth option is if you’ve been through this before and already know a specific UEI code number. Most of the time, selecting the exact model number of a device will be enough for the wizard to know how to control that device. 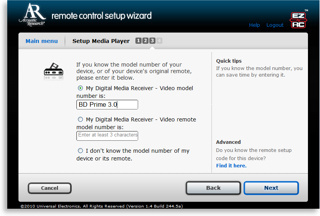 But if something has multiple possible operating codes, such as some DVD players, satellite receivers, DVRs and A/V receivers, the wizard downloads a special configuration to the remote designed to find the correct code number. 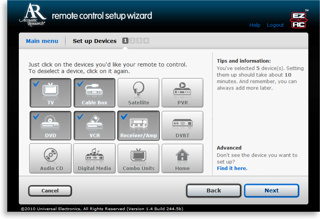 Disconnect the remote, walk over to the device, follow the on-screen steps, walk back to your computer, re-connect the remote, and the wizard updates itself with gathered information. Unfortunately this procedure is done individually on a device-by-device basis, so if you have five devices that require any sort of code confirmation this will involve five completely separate trips to and from your equipment.